ACT I. Cyprus, late fifteenth century. The Moor Otello, governor of the island and a general in the Venetian army, arrives in port as a tempest rages. Iago, Otello's ensign, confers with Roderigo, a fop who has come to Cyprus because of his unrequited love for Desdemona, a Venetian beauty recently married to Otello. Promising to help Roderigo, Iago says Desdemona should soon tire of her Moorish husband, adding that he himself has reasons for revenge on Otello, who passed him over for advancement, promoting Cassio instead. Iago proposes a toast; when Cassio declines any more drink, Iago says he cannot refuse to salute Otello's new wife. Cassio consents and grows tipsy as Iago provokes Roderigo to a duel with Cassio. When Montano, Otello's predecessor in command, tries to separate the two, Cassio attacks him as well. Otello comes out of the castle to restore order. When he sees Desdemona disturbed by the fray, he takes away Cassio's recent promotion. Sending everyone home, Otello turns to his bride, and they recall their courtship. Leading her back into the castle, Otello kisses her. ACT II. A room in the castle, opening on a garden. Iago tells Cassio that by presenting his case to Desdemona he can be reinstated, because Otello is influenced by his wife. As soon as Cassio is out of sight, Iago declares his belief that a cruel God created man wicked, and life has no meaning. Iago watches as Cassio approaches Desdemona in the garden, and when Otello comes in, the lieutenant makes casual remarks about Desdemona's fidelity. Softened by his wife's beauty, Otello greets her, but she brings up the question of Cassio's demotion, annoying him. When she offers a handkerchief to wipe his brow, he throws it to the ground, where her attendant, Emilia, retrieves it. As Desdemona tries to calm Otello, Iago orders Emilia (his wife) to give him the handkerchief. Otello asks to be alone, and the others leave, except for Iago, who hangs back to observe Otello's growing suspicion. To fan the flames, Iago invents a story about how Cassio spoke lovingly of Desdemona in his sleep. Then he mentions her handkerchief, saying he saw it in Cassio's hand. Beside himself, Otello swears to have vengeance, and Iago joins in the oath. ACT III. In the armory, Iago tells Otello that more proof is forthcoming of his betrayal by his wife and Cassio. Desdemona enters, and Otello speaks calmly until she revives the subject of Cassio. When Otello demands the handkerchief he gave her, she again pleads for Cassio. 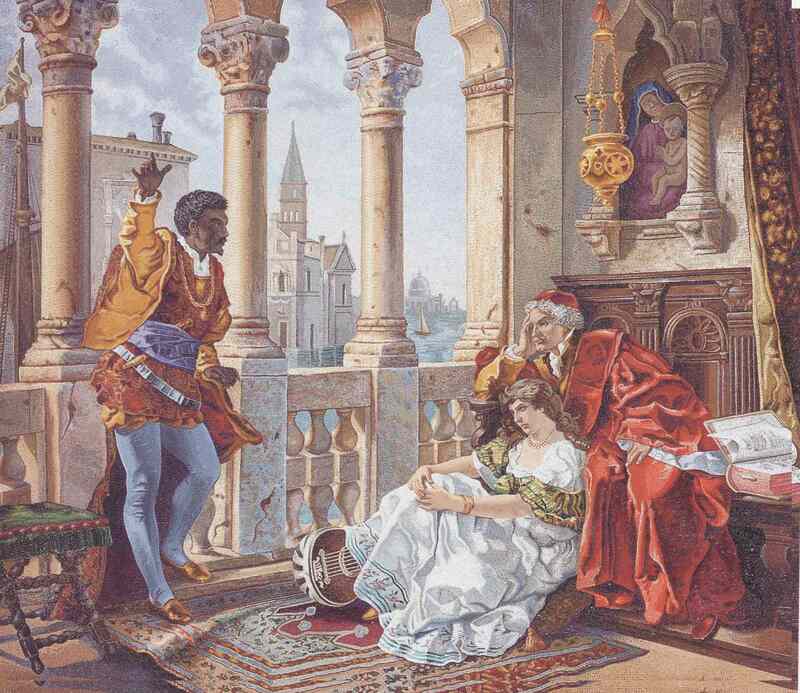 Otello calls the shocked woman a courtesan and dismisses her. He cries out that heaven could have afflicted him with anything but this, then hides as Iago returns with Cassio. Iago flashes the handkerchief he stole and leads Cassio on in banter in such a way that Otello overhears only fragments and thinks they are talking about Desdemona. As trumpets announce dignitaries from Venice, Otello vows to kill his wife that very night. The Moor greets Lodovico, who recalls him to Venice and appoints Cassio to govern Cyprus. Losing control at this news, Otello pushes his wife to the floor with insults. He orders everyone out and collapses in a seizure as Iago gloats over him, crying, "Behold the Lion!" ACT IV. As Emilia helps Desdemona prepare for bed, the frightened woman sings of a maiden forsaken by her lover. Startled by the wind, she bids Emilia an impassioned farewell and kneels in prayer before retiring. As soon as she has dozed off, Otello enters through a secret door and kisses his wife. This wakens her, but the jealous man, deaf to her protestations of innocence, strangles her. Emilia knocks with news that Cassio has killed Roderigo; entering, she is horrified to find the dying Desdemona and summons Cassio, Lodovico and Iago, who escapes when his wife reveals his treachery. Realizing his tragedy, Otello pulls out a concealed dagger and stabs himself, dying upon a final kiss.